One of the most important prophesies concerning Christ and His work on the cross is found in Daniel 9:20-27. However, because of its importance, this same prophesy has become a subject of much controversy and misunderstanding. 20) And whiles I [was] speaking, and praying, and confessing my sin and the sin of my people Israel, and presenting my supplication before the LORD my God for the holy mountain of my God; 21) Yea, whiles I [was] speaking in prayer, even the man Gabriel, whom I had seen in the vision at the beginning, being caused to fly swiftly, touched me about the time of the evening oblation. 22) And he informed [me], and talked with me, and said, O Daniel, I am now come forth to give thee skill and understanding. 23) At the beginning of thy supplications the commandment came forth, and I am come to shew [thee]; for thou [art] greatly beloved: therefore understand the matter, and consider the vision. 24) Seventy weeks are determined upon thy people and upon thy holy city, to finish the transgression, and to make an end of sins, and to make reconciliation for iniquity, and to bring in everlasting righteousness, and to seal up the vision and prophecy, and to anoint the most Holy. 25) Know therefore and understand, [that] from the going forth of the commandment to restore and to build Jerusalem unto the Messiah the Prince [shall be] seven weeks, and threescore and two weeks: the street shall be built again, and the wall, even in troublous times. 26) And after threescore and two weeks shall Messiah be cut off, but not for himself: and the people of the prince that shall come shall destroy the city and the sanctuary; and the end thereof [shall be] with a flood, and unto the end of the war desolations are determined. 27) And he shall confirm the covenant with many for one week: and in the midst of the week he shall cause the sacrifice and the oblation to cease, and for the overspreading of abominations he shall make [it] desolate, even until the consummation, and that determined shall be poured upon the desolate. Our text begins with Daniel in prayer. What were the 3 subjects of his prayers? Daniel tells us that he was confessing his personal sin. Apparently, his heart was being burdened about the need for an unhindered relationship with His Lord. He also was praying for the sins of his nation. Israel failed their Lord miserably as the nation of God. In response, the Lord allowed the Babylonians to overtake their land, overtake their temple and cause the worship of Jehovah to cease. 21) Yea, whiles I [was] speaking in prayer, even the man Gabriel, whom I had seen in the vision at the beginning, being caused to fly swiftly, touched me about the time of the evening oblation. 22) And he informed [me], and talked with me, and said, O Daniel, I am now come forth to give thee skill and understanding. 23) At the beginning of thy supplications the commandment came forth, and I am come to shew [thee]; for thou [art] greatly beloved: therefore understand the matter, and consider the vision. The Lord sent the angel Gabriel to answer Daniel’s prayer even while he was praying! What a gracious Lord that we serve. Gabriel’s visit blessed Daniel in several ways…. He gave skill – He would make Daniel an expert concerning the message he would give. What did the angel’s intervention prove to Daniel? He was loved greatly! Here, we find the beginning of the 70 week prophecy. Daniel is told that the Lord has decreed a “70 week” period of time to accomplish six Divine acts. What is meant by the 70 week time period? In Hebrew the term for “weeks” refers to groups of seven. When we do the math we find that this time period will be 490 (70×7) but it could be speaking of 490 days or years. We are not told specifically. However, in the context of the Bible we have some significant clues…. In a previous message to Daniel, the Lord describes the period of time that Israel would be under Babylonian captivity as 70 units of YEARS (not weeks) in Daniel 9:2. It is safe to assume that Daniel’s mind was running in “the year mode” not “day mode”. Also, the 7 YEAR cycle was a very familiar cycle of time for Jews. In Lev 25:1-4 the Lord gives the Jews a cycle of 7 years for the Sabbatical rest for the land. But the proof positive that this prophecy was speaking in years and not days or weeks is found in its fulfillment. As the events of our prophecy unfold, we will see that it will be fulfilled within a 490 year period. to finish the transgression, and to make an end of sins, and to make reconciliation for iniquity, and to bring in everlasting righteousness, and to seal up the vision and prophecy, and to anoint the most Holy. Finish the transgression – “To restrict, limit, or cease” Christ’s death on the cross brought an end to transgression (sin). His sacrifice resulted in a sinless eternity in His presence for Christians. This eternity will begin with the resurrection of the believer’s bodies. (Rom 6:22, John 8:34-36) No longer will transgressions be committed. Bring in everlasting righteousness – “To cause to enter” Through His death, Christ has supplied everlasting righteousness to those who have sinned against God. (2 Cor 5:21, Rom 3:21-26) This righteousness is eternal in nature. Christ paid the price for all our sins past present and future, therefore the righteousness He supplies cannot be undone… it is eternal. Seal up the vision and the prophecy – “Make an end” Christ’s first coming brought to fulfillment the OT prophetic Scriptures. Jesus was the promised Messiah of the OT (Matt 5:17-18, Heb 10:3-12) His life and work is the complete purpose and subject of the NT Scriptures. The OT look ahead to Him. The NT looks back and records His life. [shall be] seven weeks, and threescore and two weeks: the street shall be built again, and the wall, even in troublous times. But please note these 69 weeks is broken up into two groups. One group of 7 and the pother group of 62. Why are these years broken up? There was a major event that took place after the first 7 weeks (groups of 7) years in other words, 49 years. Cyrus’ decree was fulfilled with the completion of the Jerusalem streets and walls This took place in Nehemiah’s day. Please notice that after the 62 week time period the Messiah would be “cut off”. This is speaking of the crucifixion of Christ. He was crucified not because of his own sins, but for the sins of His people for whom He would die. If we remember, the end of the 62 week time period was 30 AD (the beginning of Christ’s public ministry). The beginning of the 62 week time period was the completion of the walls of Jerusalem. This verse tells us that the Messiah’s crucifixion would take place sometime following 26 AD. Christ was crucified in 30 AD which fits perfectly to this prophecy. and the people of the prince that shall come shall destroy the city and the sanctuary; and the end thereof [shall be] with a flood, and unto the end of the war desolations are determined. Here we have the result of the rejection and crucifixion of Christ being described. The invasion of Israel by the Roman army is being described. “The prince” is describing their leader Titus. By the time the invasion would be complete, Titus would have utterly destroyed physical Jerusalem and it would be left physically and spiritually desolate. This event would take place in 70 AD, 36 years after the completion of this entire prophecy. Jesus speaks of this same invasion in Luke 19:42-44. This event is commonly described as “the abomination of desolation” in Matt 24:15 and is described in Luke 21:20 as Jerusalem being “compassed about with armies”. Here we find the events of verse 26 being restated and expanded upon in verse 27. The “He” of verse 27 refers back to “the Messiah” of vs 26. Please notice the two subjects we read about in verse 26 are “the Messiah” and “the people of the prince”. If the angel was referring to “the people of the prince” he would have used the plural pronoun “they” and not the singular “he”. However, since the pronoun he uses is singular it must be referring back to a singular subject of the previous verse, in other words…. “the Messiah”. Also, please note that “he” does not refer back to “the prince”. Why? “The prince” is not used as a subject in that verse, it is used as an adjective describing “the people”. The most logical and clear reference for “He” is clearly “the Messiah”. The Messiah’s crucifixion would take place “in the midst of the week”. In other words, 3 ½ years into the final week of the 70 week prophecy. Remember, the final week of our prophecy began in 26 AD with the baptism of the Messiah. He was crucified 3 ½ years later in 30 AD. This is exactly in the middle of the final 7 year period. The angel now turns our attention to more results of the crucifixion of our Lord. The spiritual desolation of Israel began shortly after the crucifixion of Christ when the gospel message began to be sent out to the Gentile nations (Peter’s visit with Cornelius – Acts 10:). The physical desolation of Israel was begun with the Romans empire’s occupation of Israel. Both the spiritual and physical desolation of Israel was made complete (the consummation) at the invasion and destruction of the temple and city of Jerusalem in 70 AD. This was allowed to take place by God, as a judgment upon Israel for crucifying the Messiah. In that sense, Christ and His rejection by the Jews was the basis of the 70 AD invasion and the desolation of the nation of Israel. (The Abomination of Desolation of Matt 24:15). The invasion by Titus had been appointed to take place by the Lord long before the event’s occurrence. We see that here in Daniel 9:, as well as Christ, prophesying of it in Matt 24:15 and Luke 21:20. Although not mentioned specifically in Daniel’s prophecy, here are my thoughts about the ending event of the 70 weeks prophecy…..
Again, I am very confident about most of this study because the Bible speaks plainly about these things. However, the above information about the ending of the 70 week period is my speculation only. Although I feel comfortable naming Peter’s visit to Cornelius as the end point, since it is not specifically mentioned in this prophecy, my thoughts must be taken “with a grain of salt”. This prophecy in Daniel, made 490 years before it’s complete fulfillment proves that Jehovah God is the Almighty, Sovereign God that decrees, foreknows and controls all the events in the history of the world. This prophecy is just one of hundreds we find in the Bible that have been brought to completion exactly as the Lord said it would. By Rob Barkman in SIH STSTA... on June 17, 2012 . The 70 (or 69) weeks are a very interesting study. Good stuff. I have been studying Revelations of late, and many Bible scholars say Daniel’s 70th week is partly depicted in the book of Revelations. I plan to write about this soon. From what I’ve seen so far, many Bible commentaries also suggest that Daniel’s 70th week has not been fulfilled as yet since the “man of perdition” or the antichrist ushers in that period of time, which they say is actually 7 years. My study is not yet complete so I cannot say much more at this time, but I must say I enjoyed your post. 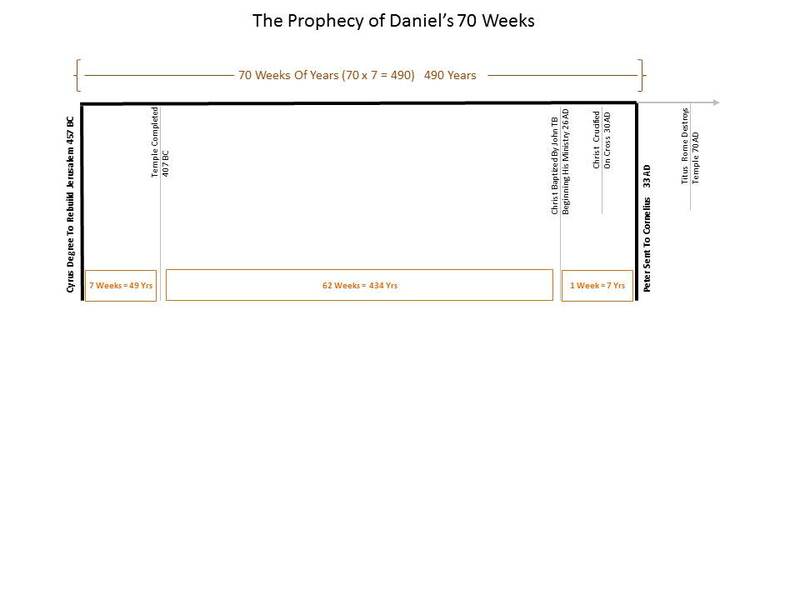 I believe that the gap theory of Daniel 70 weeks is difficult to prove contextually. As a matter of fact, I believe you will find that this belief is not common in the older writtings of the commentators. It is a relatively new teaching that came into existance in the 1800-1900. Also, as you continue to do a study on this you will find that the gap theory is the centerpiece of the dispensational eschatology system. I was taught the dispensationalism system while in Bible College but over the years, the Lord has led me away from this system of belief. Lord bless you in your studies on this very difficult subject. I hope the added info may help you in your studies. Thank you sir! 🙂 Much appreciated! Blessings! You are more than welcome. Your blog has been a source of encouragement for me as well. Lord bless you. Thank you so much Terry. It always amazes me to see how the Lord prophesied events that would take place hundreds of years later! it shows us what a great God we serve. Lord bless. Thank you for the very kind thought. The Lord has yet to bless me with a child but I certainly appreciate you thinking of me. It was a blessing. I trust you had a blessed weekend as well. Thank you dear Angela… Lord bless you! It is amazing the wonderful turths that the Lord’s word holds for each of us. Lord bless you. Thanks for your kind words. This is possibly the most comprehensive explanation I’ve read of this prophecy and it certainly makes sense. Thanks. Lord bless you. He is so great. He knows the end from the beginning… Just like in this case He knew all the events hundreds of years in advance what a wonderful Lord. !